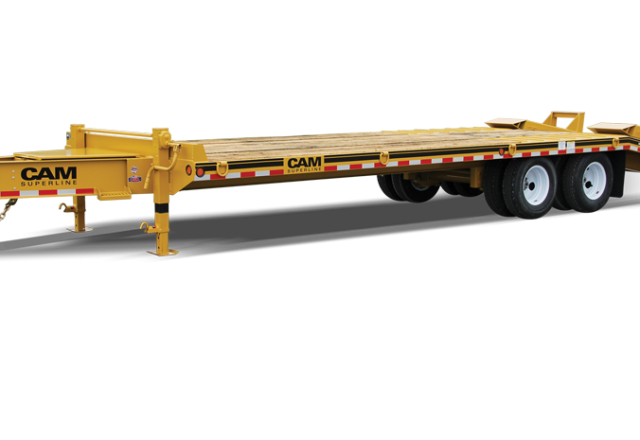 Our line of heavy duty deckover trailers are great for hauling heavy equipment to and from the job site. Standard models or custom options are available and range in size from 10 Tons to 25 Tons. Add features that fit your needs such as custom color, air powered paver ramps, hydraulic powered ramps, a gooseneck, a double break beavertail and more. Call today to order your perfect heavy equipment trailer! If you’re interested in our heavy equipment trailers for sale, click on a link below or stop by today to browse our selection. Cam Superline proves time and again that they manufacturer quality and support purchases long after they are final. Their heavy equipment trailers are made for hauling your heaviest equipment with models that can haul up to 25 tons, and can come in different colors or can be galvanized. Cam’s 10, 12 & 15 ton models come standard with 5’ bi-directional spring assisted wood filled ramps, 2” oak decks, adjustable pintle hitches, toolboxes, D-ring tie downs and a two year warranty. Options include extra deck length, winch mounts, 6’ angle/wood ramps, self-cleaning beavertail and ramps and so much more! Find even more uses for their 20 & 25 ton models that include steel plated tonques, 6’ bi-directional spring assisted wood filled ramps, 2” oak decks, LED lights, toolboxes, mud flaps, D-rings and so much more. Upgrade your heavy equipment trailer to include air ride suspension, bi-fold air powered ramps, 6’ angle ramps or a fifth wheel attachment with 11’ upper deck. Stop by today or give us a call to find your next heavy equipment trailer! I have purchased 3 trailers from TP over the last 15 years. A 5' x 8' enclosed Haulmark, a 20' Pequea flatbed and now a 20' enclosed Haulmark motorcycle trailer. This company is a pleasure to work with. They are responsive, patient and fair. I will be back for another trailer soon, I hope. Lori is THE BEST.